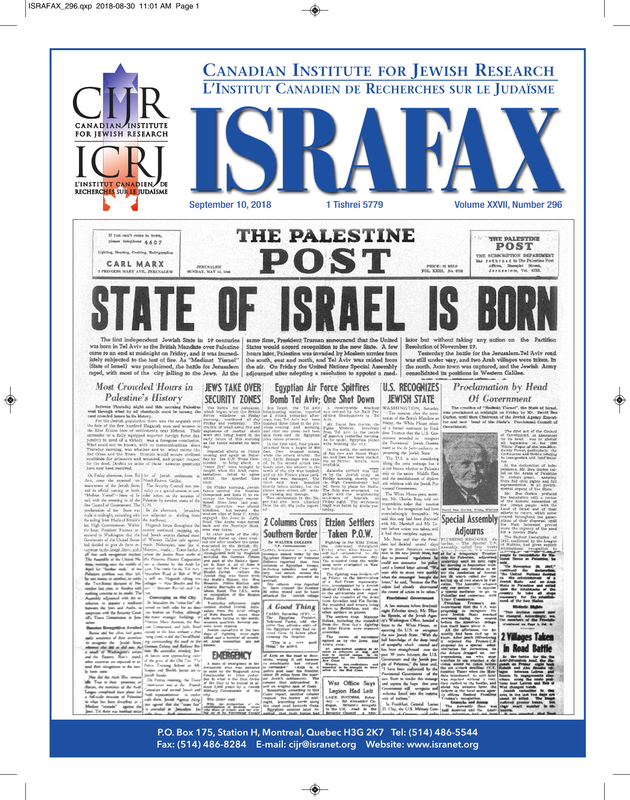 CIJR’s two Galas, celebrating its 30th and Israel’s 70th, anniversaries, span modern Israel’s development. One, in Montreal on October 14th, celebrates the role of the Israel Defense Forces in ensuring the survival and security of the new Jewish state. The other, in Toronto on October 21st, underlines the increasing diplomatic recognition of democratic Israel, and of Jerusalem, within the world community. The much-misunderstood 16th c. Florentine republican thinker and diplomat, Niccolò Machiavelli, said in his great Discourses on Livy that “good arms” and “good laws”, resting on and supported by il popolo, the people, guaranteed the stability and liberty of lo stato, the polity, or republic. (This why, remarkably for its time, Machiavelli made a Jew, Moses, a hero: our Moshe rabbenu was the greatest legislator of all history, beyond even the Athenians, Solon and Draco, because by giving God’s laws to the Jews, he created the first sovereign republic in the ancient world). Remarkably, republican, democratic Jewish Israel has survived multiple Arab attempts to destroy the tiny country, and absorbed, despite initial difficulties, repeated waves of aliyah, fulfilling its destiny as a land of refuge for the Jewish People. In the process, the Israel Defense Forces have made Israel the Middle East’s regional hegemon, and one of the world’s leading military powers. Beyond this, Israel as a modern state has become concretely what it and its capital Jerusalem have always been religiously, the center of the Jewish People. The millennial religious yearning for return from enforced exile to freedom in its own Land, which underlay and gave strength to the Zionist movement founded by Theodor Herzl, is reflected today in Israel’s vigorous, Hebrew-inflected Jewish life, religious and secular. Modern Israel, a major economic and technological power leading the West in advanced “start-up” technologies, is about to place a space satellite on the moon. And demographically it has already displaced the U.S. as the world’s largest Jewish population center. Diplomatically, Israel enjoys formal peace treaties with two former Arab enemies, Egypt and Jordan, and de facto recognition with a growing list of Sunni states like Saudi Arabia, Bahrain, and United Arab Emirates. Civil war and internal discord have paralyzed former enemies like Syria and Iraq, and forthright American support under President Donald Trump has led to the recognition of Jerusalem as Israel’s capital, and the weakening of genocidal Iran by the U.S.’s setting aside of the JCPOA treaty. and despite worrying signs of an up-tick in antisemitism (on the left and on campuses in the U.S., in Europe, and with Corbyn in Great Britain), we can nevertheless, and while remaining ever-watchful, celebrate the approaching New Year with guarded optimism and a real sense of accomplishment. Militarily, the IDF has made Israel’s survival and stability possible, just as the remarkable economic and technological ingenuity and creativity of the Jewish people has enabled diplomacy to secure its regional and international legitimacy. For its part, independent CIJR—its academic Fellows, lay Board members, and wonderful students—is proud to have played a creative and steady role in defending the Jewish state and Jewish people, and in ensuring Jewish continuity, over the last thirty years. Paul Merkley: A CHRISTIAN ZIONIST PERSPECTIVE ON THE NEW “NATION-STATE” LEGISLATION.